For $160, the X Chroma gives you almost everything you could possibly need in a gaming keyboard (and maybe even a little more). Like past Blackwidows—and really any peripheral from Razer—the keyboard is all black packed in a sharp spartan design. But what makes the Blackwidow X different from previous Razer keyboards is its exposed metal skeleton. Even though the keyboard sheds the plastic casing found in the original Blackwidow Chroma (and the goofy “Razer” font on the keys”, it still makes for one weighty and substantial gaming device. Believe me, I trekked with this thing between Manhattan and Brooklyn a couple times, and it’s a cumbersome beast. But despite its more stationary inclinations, the build quality is absolutely worth it and that semi-reflective metal improves on the BlackWidow’s other big eye-catcher—its built-in RGB light show. With the “Chroma” moniker comes a fully-lit RGB keyboard with millions upon millions of color variations. Controlled through Razer’s Synapse 2.0 software, you can tweak lighting and create gaming profiles and shortcuts—highlighting keys you use often and dimming those you do not. You can even see heatmap or keystroke data after a hectic session. It’s not something I’d ever use, but hey, it’s there if you want it! All this customization inevitably comes with some confusion. Like most peripheral software, including Logitech’s G series, Synapse 2.0 isn’t that intuitive. You need a few minutes to poke around and get the dozens of controls and options locked in your brain. It gets even more complicated when you begin layering lighting effects. Yet after you get the lay of the digital land, it’s incredible how much you can do to this thing. Razer Synapse 2.0's Chroma configurator...It’s more intimidating than it looks. But his all-metal, color-filled keyboard is just well-dressed snake oil if it doesn’t actually work well. I tested the BlackWidow X Chroma on a steady diet of RPGs (Fallout 4), first-person shooters (Battlefield 4), and indie top-down shooters (Hotline Miami) on our office’s super-powered Maingear PC and the keyboard has worked flawlessly. When I sat down to test the BlackWidow, my original dislike of mechanical keyboards began creeping in, only because the height of the keys themselves looked tiresome and unnecessary. But Razer’s Green switches were incredibly easy to press, only needing 50g of pressure (aka actuation force) to activate. That’s standard, especially compared to popular Cherry MX Blue switches, but with less key travel (shorter distance to actuation), Razer’s switches give a faster responds while still proving that oh-so-nice tactile feel. And I loved it. I completely worked this thing out, not only gaming but writing articles and working full 10-hour days, which inevitably involved writing this article about gaming while working. My hands never tired, and the Blackwidow X Chroma never let me down once. As for others working in my immediate vicinity, they might have been less enthusiastic about my mechanical keyboard renaissance. Using Razer’s Green key switches, every single keystroke resonates with a loud clack. The few times I used the X Chroma around coworkers while testing a mobile PC, I saw several craned necks trying to see where in the hell the noise was coming from. Razer does have quieter Orange keys, but those haven’t made their way to the new X Chroma—at least not yet. And, besides, most of my was spent either blasting music or game soundtracks through Bluetooth headphones. Regardless, this keyboard it’s probably best used in seclusion. It’s not all sunshine and keyboard-powered rainbows. The Chroma X does miss out on some features that might be worth having—both involving USB. The unit doesn’t have a removable USB cord, which always makes me nervous by putting all my hope onto this one braided cord (this is also another reason why the Chroma X might not be a great idea with the wear-and-tear of traveling). The second is no USB passthrough, which isn’t a huge deal if you have a dedicated gaming rig, with ports aplenty, but for people like me who are strapped for ports, having some built into the BlackWidow X would have been an awesome bonus. Those are small complaints though. Primarily because the Razer’s BlackWidow X Chroma is the first mechanical keyboard where I thought “Ok, I get it.” This keyboard’s compact metal frame and nearly endless customization makes my laptop keyboard feel like a piece of crap. That’s a low bar, but it’s also one I’ve never had the urge to step over before. Razer’s software works way better on Windows—Mac users be warned. Added function keys help you enter “Game Mode” with a quick shortcut, cutting off all accidental menu shortcuts in Windows. Would really like some USB ports on this thing. I’m all about ports. Can’t wait for those quieter Orange switches. 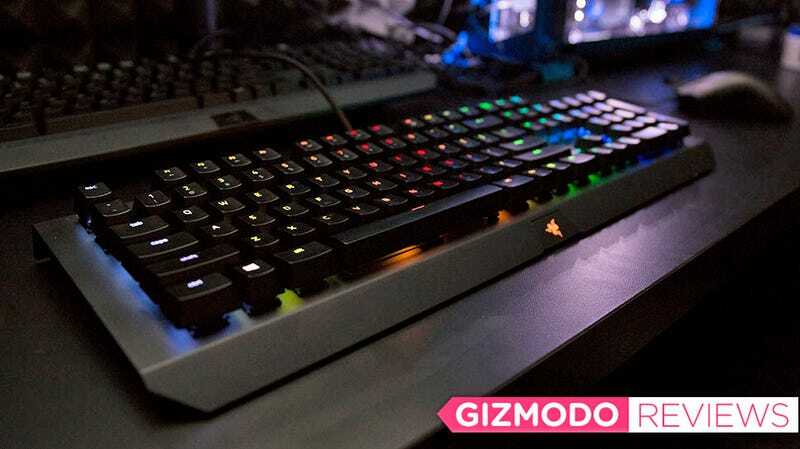 Razer says it guarantees an 80 million keystroke lifespan. We obviously couldn’t test this benchmark, but that’s a good chunk of time if true.